Google has sent out media invites for an event on October 9 where it is expected to take the wraps off the next-generation Pixel smartphones as well as some more hardware offerings. Google has sent out media invites for an event on October 9 where it is expected to take the wraps off the next-generation Pixel smartphones as well as some more hardware offerings. The tech giant will host its annual 'Made by Google' event in New York where the much talked Pixel 3 and Pixel 3 XL could be presented before the world along with some other devices by Google. Many are expecting a new Pixelbook and a lot more to be part of the itinerary. 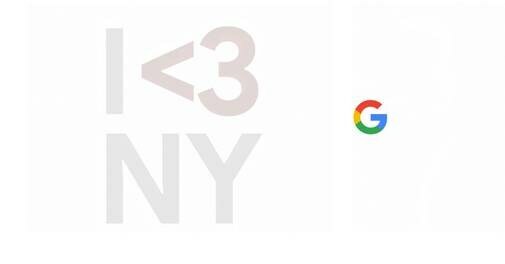 The invite is a GIF with white background with 'I <3 NY' written in the first frame and the Google logo on the second frame. The '3' could only be indicative of the Pixel 3 series of smartphones. With its third generation of smartphones, Google is changing the launch venue and date. Google has hosted its earlier hardware launches in San Francisco, closer to its headquarters in Mountain View, California. The date for the Google event has also been changed to October 9 from the usual October 4. While the Pixel 3 smartphones, especially the Pixel 3 XL, have been all over the news, Google has been tight-lipped about the devices all along. It was recently spotted on the US FCC site. Pre-production units of the Pixel 3 XL even came up on the Russian black market where it was being sold for $2000 during the last week of August. Several high-quality leaks and even full-fledged reviews followed, with Google assuring to look into it. The leaks showed the Pixel 3 XL with a massive notch and chin. The notch will house two selfie cameras along with a speaker and other sensors. The Pixel 3 has also had its fare share of leaks, which show the device without a display cut-out and a 5.5-inch screen. The Pixel 3 and the Pixel 3 XL will be powered by the Qualcomm Snapdragon 845 chipset. Since the Pixel 3 smartphones are going to give the 3.5mm audio jack a miss, speculations are that Google might introduce the second generation of Pixel Buds during the Made by Google event. A smart display powered by the Google Assistant could also be in the offing, counter the Alexa-powered Echo Spot and Echo Show by Amazon. Rumours also indicate that Pixelbook 2 might make an appearance at the New York event. Meanwhile, a new Chromecast has been spotted on the US FCC and could be unveiled by Google at its event.